Alzheimer’s disease and other types of dementia can steal a person’s ability to think, recall memories, communicate and connect with others. In doing so, dementia slowly undermines qualities that help to define who we are. As someone loses their identity, are they still the same person? This quote comes from a book called Dementia Reconsidered: the person comes first, published in 1997. The author, Tom Kitwood, was a psycho-gerontologist at the University of Bradford in England. He passed away in 1999, but his approach of centering dementia care around an individual’s personhood is still influential today. Kitwood was the first to apply the term “person-centred” to dementia care, and his definition of personhood is one of the Alzheimer Society of Canada’s guiding principles. Preserving personhood is at the heart of person-centred health care. As the name suggests, this is a model of care that views people with health conditions as people first. Person-centred (also known as patient-centred or client-centred) care recognizes a person’s inherent value and dignity, respects individual preferences and choices, and supports holistic well-being (body, mind and spirit). It prioritizes the needs of people with dementia over the needs of organizations. 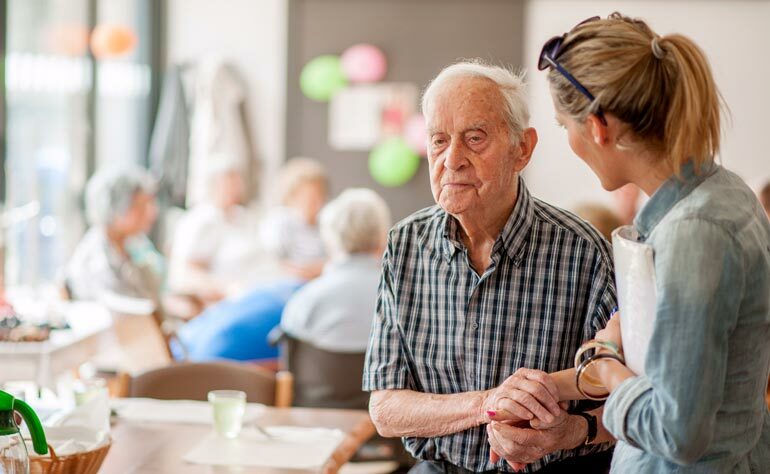 It also fosters relationships and collaboration among people with dementia, family members and healthcare staff to improve quality of life for everyone. Look beyond your loved one’s symptoms. Dementia can change a person’s capabilities, personality, mood and behaviour. Focus on abilities rather than losses. Acknowledge the person’s emotions and, as much as possible, consult them about their wishes, preferences and needs – avoid making assumptions. If using language is a challenge, learn new strategies for communication. Include the person in discussions about their care, and try to plan for the future together. Use person-centred language. Words are powerful, and they can influence our perceptions and behaviour. “By being more conscious of the language we use, we can avoid reducing individuals with Alzheimer’s disease and other dementias to a series of labels, symptoms or medical terms,” says the Alzheimer Society of Canada. For examples and tips, read the organization’s Person Centered Language Guidelines. Help others get to know and understand your loved one. Family members, friends and caregivers “play a pivotal and unique role by contributing personal knowledge to better help formal caregivers preserve personhood in late dementia,” says the Interior Health Authority in British Columbia. With your help, care providers can learn about your loved one’s history, preferences and goals, and tailor their interactions accordingly. You could create a “Life Story” book to provide information about your loved one (for tips, see Interior Health’s A Guide to Creating a Life Story for Care-giving). Another idea – this one from the Alzheimer Society of Canada – is to fill out a “Resident’s Day” form that describes, in the voice of the person with dementia, their preferences and needs for a full day, from wake-up time to bedtime routine. Help your loved one maintain relationships and activities. Our sense of identity comes, in part, from our connections to others and the things we like to do. Helping your loved one continue to have meaningful social interactions and participate in activities can help to preserve their sense of self and offer welcome distraction from the stressful aspects of having an illness. Read more about the benefits of staying active. This framework from the Alzheimer Society of Canada explains the person-centred approach to dementia care. The Alzheimer Society of Canada launched this culture-change initiative in 2014. It was created for healthcare professionals at long-term-care facilities, but the families and caregivers of people with dementia can also learn from its recommendations.